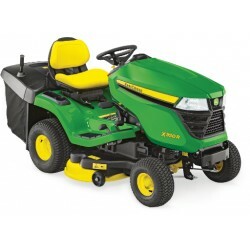 The John Deere X116R is a fantastic rear discharge, rear collection lawn tractor fitted with a powerful 7.59 kW at 3350 rpm single-cylinder engine, automatic transmission and exceptionally easy to use foot controls. It is also fitted with a 32" (92 cm) Edge Mower Deck and a 300L hopper. The X116R has been specifically designed for customers who want the highest quality product available for mowing and collecting grass cuttings and leaves. The 32" Edge Mower Deck does an amazing job of doing just this. The hopper is also easily removed and it can be easily replaced with an optional discharge deflector or mulch plug, for times when it may not be desirable to collect the material. A rear hitch is included with the X116R and is able to tow a wide variety of equipment making it able to complete almost any lawn care job. The powerful 7.59kW single cylinder engine has plenty of power and torque which can handle tough mulching, mowing and bagging conditions. It features electronic ignition for fast starts, a cast-iron liner for increased engine life, overhead valves for efficient power and fuel economy, an anti-vibration system and full pressure lubrication and oil filter for cleaner oil, prolonging engine life and extending the time between oil changes. The engine has been designed to be more effective when operating the tractor on an incline. The John Deere X116R features a Kanzaki® Tuff Torq® hydrostatic transmission which gives an infinite choice of speeds and makes changing the direction of travel easy. Side-by-side foot pedals control the speed and direction of travel. The automotive-style accelerator controls ensure easy operation and the operator can change the direction of travel without lifting their foot off of the platform. The X116R has a solid one-piece frame which has been constructed from 12-gauge, 2.7mm steel. It is full length and has been robotically welded and has high-strength steel rails for superior reliability and long life. The Operator station has been designed for optimum operator comfort and easy operation. The controls are positioned where they are easy to reach and use to control the tractor. The steering wheel is positioned and angled to give the operator plenty of room and steering comfort. The seat is tilted back at the optimum angle to provide the most comfortable operator position. The contoured dash is both functional and attractive. The hour meter makes it easy to tell when oil changes and other maintenance tasks should be performed. The controls are colour coded and labelled, making it easy to identify them and they are also logically placed and within easy reach. The design of the controls is both functional and attractive.